What does this El Niño-on-steroids have in store for us this coming winter? 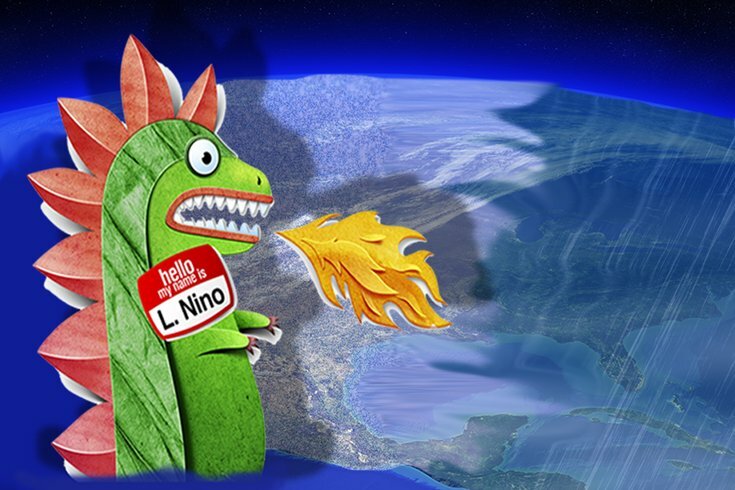 El Niño will be the so-called Godzilla effect on the weather this winter. El Niño is a warm ocean current of variable intensity that develops along the coast of Ecuador and Peru and sometimes causes catastrophic weather conditions. Forecast to reach record levels as we move into December, El Niño has already surpassed 1982-83 levels and should eclipse the 1997-98 record highs. Usually a strong El Niño for the Northeast means above normal temperatures and snow amounts that trend on the lower side, but this year's winter forecast is full of loopholes and potential disasters. For us in Philadelphia, the true kickoff of winter should be delayed until we start to roll into mid-late January. Let me start off with what I'm fairly confident of: a super strong El Niño will produce a conveyer belt of storms, supercharged by the warm and moist Pacific flow, an atmospheric river often referred to as the "Pineapple Express." This will lead to potentially destructive storms that will first slam into the California coast, producing record rains (yes, it will help the drought), mudslides and huge amounts of snow in the mountains. Next stop on the storm machine will be the Southwest with heavy rains and record snows, then a dip into the Gulf of Mexico where the storms will refuel on its warm waters, continue east and spread severe weather across the Southern Plains, Gulf states and pound away at Florida, while at the same time unusually cool temperatures colliding with the warm unstable air will enhance severe weather across the Southeast as well. Now what does this El Niño-on-steroids, this so-called Godzilla in the Pacific Ocean, have in store for us this winter of 2015-16? I typically use four key atmospheric players in my long-range winter outlook. But this winter I'm adding another – "The Pacific Blob." • PNA – Pacific North American teleconnection. As I already went into detail with ENSO, the super strong El Niño usually leads to above normal temperatures here in the Northeast and I believe this will be the case this winter season. But I'm expecting the coldest part of this winter season to be delayed until late January with the best chance of significant snow during the second half of winter. March could shape up to be quite volatile with wild temperature swings, and a roaring late season snowstorm wouldn't surprise. My thinking here is that El Niño will start to cool off quickly, allowing for an entrance zone for mid-late Arctic intrusions, although in the final analysis, temperatures this winter should average significantly above normal. For us to get significant snow this season, the AO must at some point swing to the negative phase; currently it's positive, keeping us on the milder side for November. We have a couple of signals indicating that AO could swing generally negative during the heart of the winter. Siberian snow cover to date is more widespread than normal ( indicating a potential for a pendulum swing to the negative) but not as advanced as the last two years. If you remember, last year was wicked cold. Snow cover is advancing more rapidly than normal but not as quickly as the last two winter seasons – that's good news. If the AO remains on the positive side this winter, we can expect below-normal snowfall. The average snowfall for an entire winter season is 22.4 inches in Philadelphia. The PNA, usually via warming of the Northwest Pacific ocean, leads to what we call high pressure ridging (think a mountain of air) that helps to guide a cold northwest flow across the Midwest and into the Northeast, setting up a deeper East Coast trough that enhances storms along the coast. Remember Boston last year and the crushing 108.6 inches of snow that fell there. An all-time record. That will not happen this year. Usually a strong El Niño will wipe out the chances of strong ridging, however, we now have the "Pacific Blob." Scientists have been watching a huge persistent patch of unusually warm water over the eastern Pacific just off the California coast. Named "The Blob" by a NASA scientist, it has been linked to deflecting jet streams, intensifying California's drought and reports of freaky marine life. If "The Blob" persists it can help re-enforce ridging along the Pacific northwest, which would help force much colder air eastward. It's an interesting theory, but for now that's all it is. Keep in mind that we severely lack climate data when it comes to a massive El Niño. Only two seasons have had comparable El Niños: the winter of 1997-1998, when we had only eight-tenths of an inch of snow, and the winter of 1982-83, which hit us with 35.9 inches of snow. Quite the spread. California (especially the southern part of the state) and the Southwest will bare the brunt of this winter season, with possible destructive storms accompanied by flooding rains, and massive snows for the Mountains. For us in Philadelphia, the true kickoff of winter should be delayed until we start to roll into mid-late January. The brunt of winter appears to be set for the second half from mid-February through most of March. The storm track stirring the most concern will be one from the Gulf of Mexico and then heading up along the East Coast – with the biggest threat across the Mid-Atlantic, south of Philadelphia – down toward the Virginia Tidewater region. This would represent a dramatic shift from last season when the focus was on New England. This season I believe New England might escape the bullet; the storm bullseye looks to be hanging on the Mid-Atlantic. Philadelphia as it stands now would be right on the cusp of major storms featuring heavy rains and or wet snow depending on numerous atmospheric positionings. It's almost foolish of me to try and formulate a snowfall total for the upcoming winter season. Do you think there was one meteorologist on the planet who forecast triple digits for Boston last year? Enough said. The extreme cycles of weather that have been growing in frequency with each passing year has led me to re-evaluate my thinking in projecting snow amounts for an entire winter. My responsibility to you is to provide an overall outlook (not a forecast). In other words, how I think the atmosphere will react – based on the limited data we have – in this time of uncharted atmospheric change. It's simply not responsible anymore to perhaps mislead you with "snow totals" for the entire winter season. It's now beyond a forecasting skill. Temperatures: Should average significantly above normal. Potential snow totals for 2015-16 for Philadelphia: Trending below the historical average of 22.4 inches. Jon Bolaris will be writing a weekly snow outlook for Philly Voice starting next Monday.